For the winter sport, see Skeleton (sport). 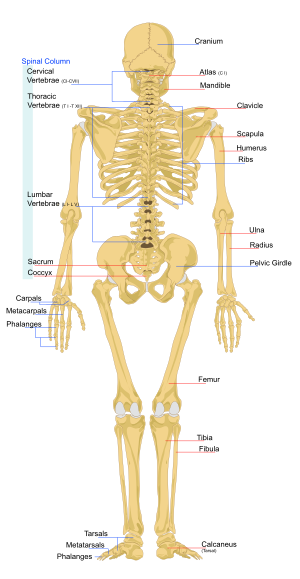 A skeleton is the hard structure that supports the body of a living thing. Skeletons can be inside the body or outside the body. In mammals, which include humans, the skeleton is made of bones. All the bones, when they are joined together, make the "skeletal system" of a body. The skeletal system or "skeleton" is under the skin, the muscle and the tissue of the body. 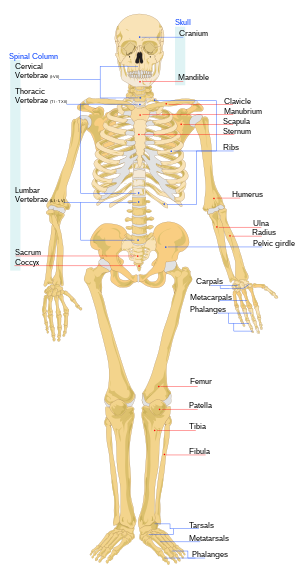 The skeleton supports the skin, muscle and tissue, and all the organs that are inside the body. The skeleton protects important internal organs like the brain, heart and lungs. If humans didn't have a skeleton then the body would be flat as the skeleton gives the body its frame. Creatures that have skeletons inside their bodies are mammals, birds, reptiles and fish. A skeleton that is on the inside is called an endoskeleton. Some creatures, called arthropods, have skeletons outside their bodies. These are insects (like ants and bees), arachnids (spiders and scorpions), and crustaceans (sea creatures like crabs and lobsters). These creatures all have skeletons made of hard plates or shells. This kind of skeleton is called an exoskeleton. The important parts of a human body are the head, the spine, the chest, the abdomen, the arms and hands, and the legs and feet. The head bones all together are called the skull. The skull is made of a group of curved bones fitted together like a ball, which protects the brain, the eyes and the inside parts of the ears. The bones of this part of the head, together, are called the cranium. The skull has a top jaw, and a bottom jaw, with teeth in them. The jaws are called the "upper" and "lower" mandibles. The "lower mandible" is moved by strong muscles so that the teeth can bite and chew food. There are several other small bones which make up the face. There are also several small bones in the front and side of the neck. The smallest bones in the body are three tiny bones inside the ear, which vibrate to help a person hear sounds. The spine supports the head, the chest and the structure that carries the arms. It is made of small bones called vertebrae. The spine, all together, is called the spinal column. It is not straight, but has curves that help to support the body, and help the person to move and bend. One bone is a "vertebra". Lots are "vertebrae". The "vertebrae" have different names, depending on the part of the body they are joined to. The vertebrae of the "lower back" are called the lumbar vertebrae. The next vertebrae are joined together in a triangular shape called the sacrum. The hip bones are attached to the sacrum and support it. At the bottom of the "sacrum" are some little tail-bones. They are called the coccyx. On many animals the "coccyxal vertebrae" are long, making a tail that the animal can move, but on humans, apes and some other creatures, they are very short. This part of the body is made of the sacrum and the two pelvic bones which are joined to it on either side. The pelvic bones are carried by the leg bones, and they support the "spinal column". Each pelvic bone has a strong structure for the leg bone to fit into, so that a person can stand, walk, run and jump. Each pelvic bone spreads into a large flat plate which supports the person's "internal organs". The pelvis of a woman spreads into a wider shape than a man's, so that when the woman is pregnant, the baby is supported by the pelvis, until it is ready to be born. At the bottom of the pelvis is a large opening, big enough for a baby to pass through. The chest is called the thorax, and the vertebrae that are part of it are the thoracic vertebrae. The thorax is made up of long flat curved bones called ribs. At the back, the ribs are joined to the vetebrae. At the front, most of the ribs are joined to the sternum, which is often called the "breast bone". All together, the "thorax" protects the heart, lungs and stomach. At the top of the "thorax" is the shoulder girdle. This is made of two thin horizontal bones at the front, joined to the "sternum". These two bones are called the clavicles or "collar bones". At the back of the "thorax" are two flat triangular-shaped bones called the scapulae, or "shoulder blades". The "clavicles" and "scapulae" come together on each side to make "shoulders". The bones of the arms fit into sockets (cup-like holes) in the "scapulae". Arms and legs both have a thicker bone at the top and two thinner bones at the bottom. They both have a rotating joint at the top, and a hinge joint in the middle. The hands and feet have lots of bones and are joined to the arms and legs by small bones with sliding parts. The upper bone is the humerus, so when people bang their elbow, they often say that they bumped their "funny bone". The bone that sticks out at the elbow and runs down the outside of the arm is the ulna. The bone that is on the thumb-side is called the radius. Near the elbow, it is joined to the "ulna" in a way that allows it to rotate. The "radius" and the "ulna" can twist around each other, allowing a person to turn their hand. The small bones of the wrist are called carpals, and the bones inside the hand are called metacarpals. The finger bones are the phalanges. The upper bone of the leg, which is the longest bone in the body, is called the femur. The bone at the back of the leg is called the tibia, or "shin bone". It makes the inside ankle bone. The thinner bone at the side of the leg is called the fibula. It makes the outside ankle bone. The small bones that join the foot to the leg bones and allow it to move are called the tarsals. The bones inside the foot are the metatarsals. The toe bones are called phalanges, like the finger bones. The leg has another bone. At the front of the joint where the "tibia" meets the "femur" is a small round bone like a little shield, to protect the joint. It is called the patella. A skeleton, or just a skull, has often been used as a symbol for Death. Skeletons and skulls can be seen carved on many tombs, from ancient times to the 20th century. Skeletons or skulls are often seen in Medieval and Renaissance paintings or stained glass windows, reminding people that life is short. Skeletons or skulls were often used as a sign to frighten people. Skeletons would be left hanging in public places, such as cross-roads or bridges to remind the people of a town that they would be punished by death if they broke the law. Skeletons or skulls were a symbol used by pirates. 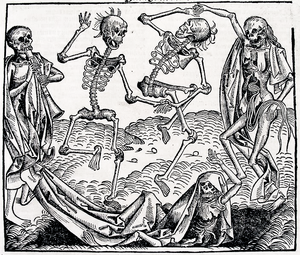 Skeletons, particularly living skeletons, have often been used in horror stories and comedies. There are stories where skeletons rise from the dead. Things that come back to life are called undead. In these stories, most skeletons are controlled by a person who brings them back to life. These people are called necromancers. A Necromancer uses magic to make the skeleton move and act upon his/her will. Skeletons appear in the popular game: Minecraft. In Minecraft, skeletons have bows that try to shoot the player.